We finally got our first look at Kingsman 2 recently and, for a first teaser trailer, it was a pretty good first look. But since Kingsman: The Secret Service was an R-rated movie, it is a bit hard to capture the spirit of it while making it appropriate for all audiences. Luckily, Fox has now released a red band version of the new Kingsman: The Golden Circle trailer that packs a punch. 20th Century Fox decided to debut the first trailer for Kingsman: The Golden Circle on The Late Late Show the other night, so it had to be totally clean in order to play it on TV. As anyone who saw the first Kingsman knows, this is is not a squeaky clean franchise. While the new red band trailer is largely the same, the very end of the trailer features Eggsy dropping a pitch perfect F-bomb, which really helps sell the end of the trailer and makes it stick. Also, the movie is still about five months away, so Fox probably didn't want to give too much away in this first teaser. They definitely succeeded on that front. In the trailer, we see the Kingsman headquarters being destroyed by a missile, which we can assume will come from Julianne Moore, who is playing the villain this time around. We also see some serious, old-school James Bond vibes, with Eggsy driving a submarine car. There is also some pretty appropriate and rather surprising music in the background in the form of Frank Sinatra, which sets something of a somber tone, despite all of the crazy action. Most of what we see isn't given a lot of context, but it very much looks like it takes the best parts of Kingsman: The Secret Service while mixing in some new elements. Like cowboy Channing Tatum, for example. 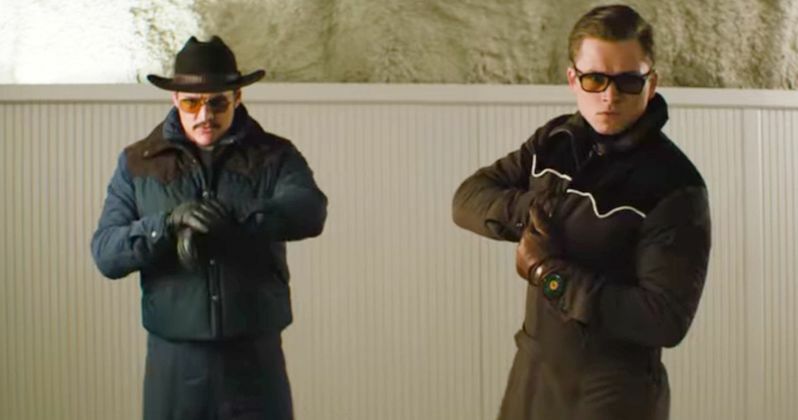 Kingsman: The Secret Service sort of snuck up on everyone in 2014 and wound up being one of the pleasant surprises that year. The movie brought in $414 million worldwide with very little brand recognition. Since so many people loved the first movie and since the sequel has added some big name talent, don't be at all surprised if Kingsman 2 winds up grossing a whole lot more than its predecessor. A lot of that will depend on whether or not director Matthew Vaughn, who is returning to direct Kingsman: The Golden Circle, is able to once again make a quality movie. His track record seems to suggest that won't be an issue. Kingsman 2 will see the return of cast members Taron Egerton, Mark Strong, Sophie Cookson and Colin Firth, with some new additions in the form of Channing Tatum, Julianne Moore, Elton John, Jeff Bridges and Halle Berry. Kingsman: The Golden Circle is set to hit theaters on September 22. Be sure to check out the new red band trailer for yourself below.